I read The Last Theorem by Arthur C. Clarke and Frederik Pohl and an important part of the plot is the construction of a space elevator. There, the authors explain to you what an space elevator is, how does it work, what are the challenges and even who invented them. Apparently in the 19th century some guys already dreamed (and wrote about) space elevators. I bet it was dreamed even before that, but at any rate, I invented them as well. When I was a kid, the house where I lived used to have scaffoldings here and there quite frequently. It was never finished. 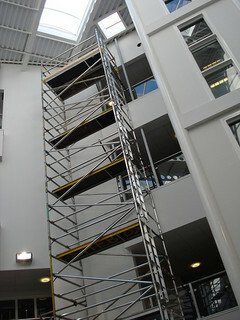 I grew up playing in scaffoldings and like some kids build a house in a tree, I built it on scaffolding. It was amazing! I loved it. Obviously I started thinking how high could I build a scaffold? With my child’s mind I saw no limit but I realized that at some point, the outer part would pull instead of push and I fantasized about a scaffold that would reach the moon. A bit more than a mere space elevator. In my phantasy one would climb the scaffold in a space suit, reach the top and when the moon passed by grab onto it: a small grab for a mind, a giant leap for the scaffolding industry.